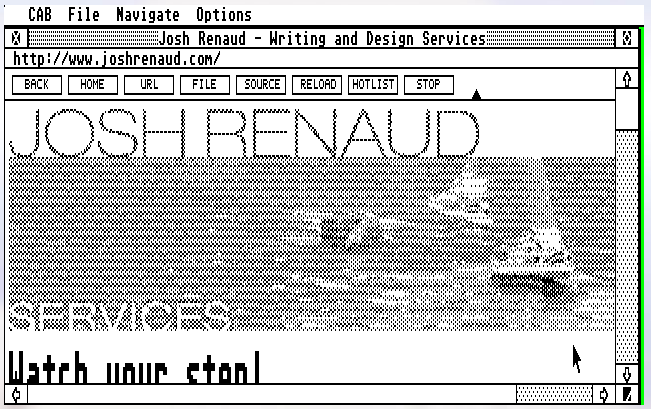 Break Into Chat | Josh Renaud's blog about BBS history, retro computing and technology reminiscences. This image shows a CosmosEx screencast of an Atari Mega STe in high resolution. Throughout my Atari ST-owning life, I have only ever owned Atari’s color monitor, the SC1224. It can display two of the ST’s video modes: low resolution (320×200, 16 colors) and medium resolution (640×200, 4 colors). The Atari also had a 640×400 high resolution mode, but it required a different monochrome monitor. I never had one, but recently I came across some high-res software I wanted to test. What to do? I immediately thought of the CosmosEx and its “screencast” function, which lets me see and control my Atari Mega STe remotely via a web browser. I thought: what if I turn off my monitor, so the ST doesn’t know what sort of monitor is attached, and then run it remotely via the CosmosEx screencast function? I tried this idea, but alas, it didn’t work. 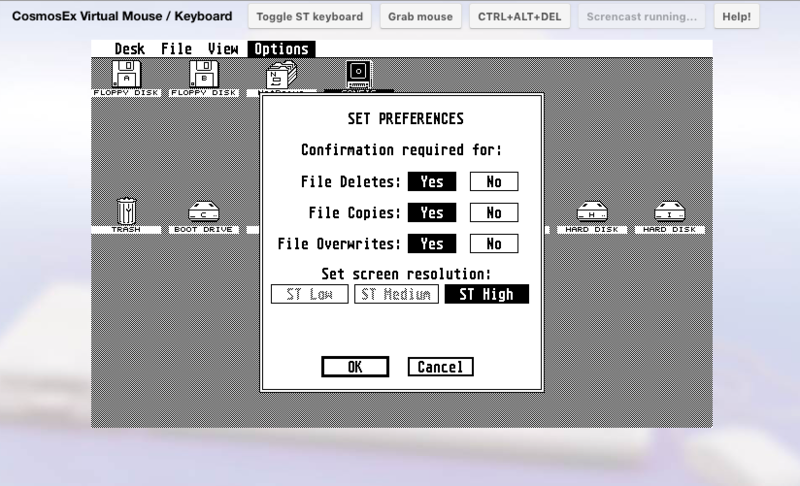 The “ST High” option remained grayed out among the “Set screen resolution” choices. So, I asked on atari-forum, and AdamK pointed out that the ST detects the presence of a monochrome monitor when the MONO DETECT signal is connected to the GROUND. I looked up a fantastic wiring diagram of the Atari Video Connector, and found that pin 4 is MONO DETECT, and pin 13 is GROUND. 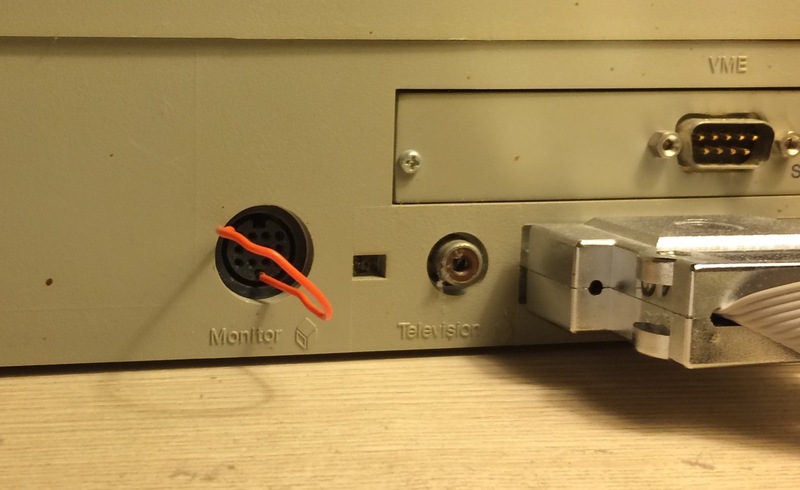 This photo shows a wire connecting pins 4 and 13 of the Atari Video Connector, tricking the Atari into thinking a monochrome monitor is attached. Make sure that CE_CAST.PRG is copied into your AUTO folder first. After that, I disconnected the monitor cable, inserted the wire, rebooted the Atari, then launched the screencast webpage in a browser on my Mac. Voila! It booted into monochrome! This is awesome. The screencast can be a bit stuttery, and the mouse is hard to control, but it works! Best of all, I didn’t have to buy a second Atari monitor. This entry was posted in Uncategorized and tagged atari st, cosmosex, hardware, monitor, resolution, retrocomputing, wiring on Feb. 11, 2019 . This year my family was planning to take a trip to South America. As we prepared, I was struck by the idea of fixing up my old iPod 3G so that the kids could use it to listen to music while we traveled. I’m talking about my 15-year old touch-wheel iPod 3G. The battery has long been shot, and I have had trouble with the hard drive over the years. 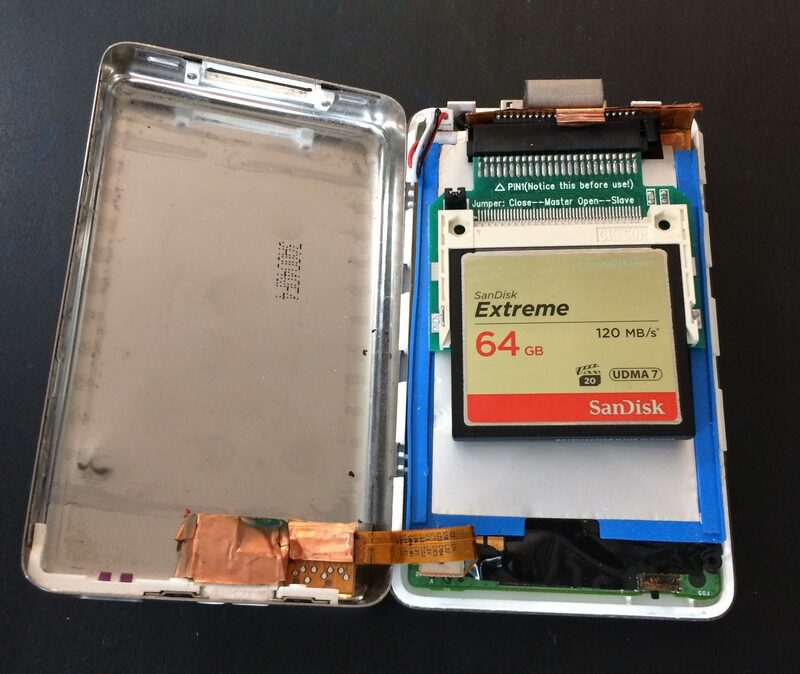 I found quite a few tutorials online about how to install a new battery, as well as some which explained how to replace the hard drive with a CompactFlash card. Sweet! Sounded like a great way to soup up some old hardware: better battery life, more durability, and lighter-weight. This entry was posted in Uncategorized and tagged cf, compact flash, firewire, ipod, ipod 3g, iTunes, mac, mod, mp3, upgrade, usb on Jul. 3, 2018 . In December, I created a new ANSI animation for the holidays called “Star Trek: The Trouble With The Rangifer Tarandus”, which was released in Blocktronics’ “Darker Image #2” artpack. But (as always), the best way to view this is to use SyncTerm to connect to my BBS, Guardian of Forever, and watch it there. So far, each of my ANSImations have been a way to try a new technique in ANSI, whether that’s parallax scrolling, perspective transforms, or whatever. This time was no exception. This entry was posted in Uncategorized and tagged animation, ansi, ansimation, art, blocktronics, demo, fade, star trek on Feb. 14, 2018 . This screenshot shows CAB rendering my personal website. This instance of CAB is running on an Atari Mega STe. Probably the best retrocomputing purchase I’ve made in recent years is the CosmosEx, a cool peripheral for Atari ST, STe, TT, and Falcon computers. Soon after I bought it, creator Jookie added “screencasting”, a feature which lets you control your Atari remotely through a web browser. Amazing! Fast-forward to this week. I decided to see if Jookie ever got the drivers were working. Turns out he did! Keep reading to see how I set everything up. This entry was posted in Uncategorized and tagged atari, atari st, cab, cosmosex, internet on Sep. 5, 2017 . 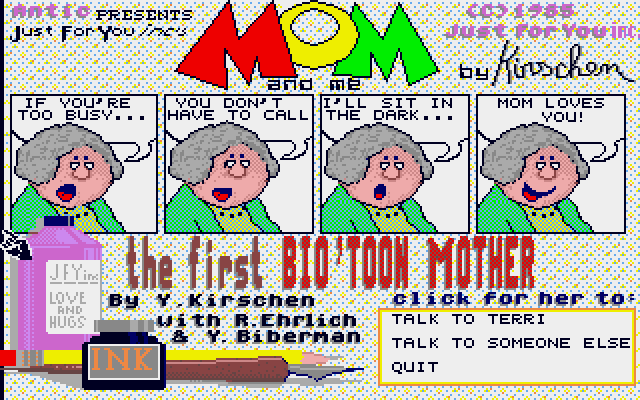 You may recall that two years ago I blogged about two old Atari ST programs I remembered from my youth – “Mom and Me” and “Murray and Me” by the cartoonist Yaakov Kirschen. The programs were published by Antic Magazine, and billed as the first “biotoons,” a sort of artificial intelligence cartoon. They were even reviewed in both the New York Times and and the Los Angeles Times in 1985. Anyway, two years ago I assumed someone out there had archived disk images of these programs. But I was completely unable to find any. I had copies on old floppies myself, but those floppies stopped working reliably in the 1990s on my Atari 1040 STe. I assumed they were still no good. Tonight I pulled them out, dusted them off, and gave them a try in my Mega STe. I had mixed success! I was able to load “Mom and Me” and play the simulation. Even better, afterwards I successfully duplicated the disk and transferred a copy to my Mac. Want to try it yourself? Download “Mom and Me” as a ZIP file. 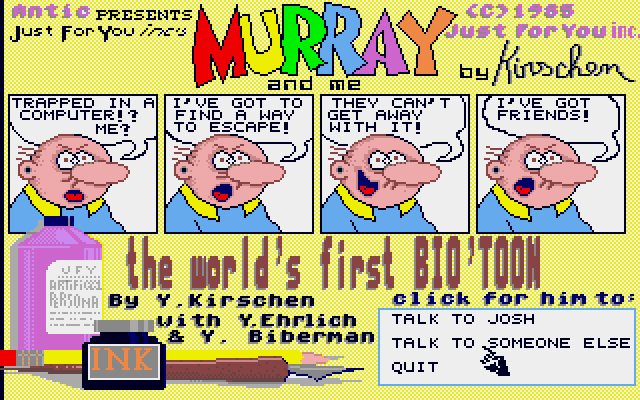 As for “Murray”, I got the title screen to load, but couldn’t get him to actually play. I tried copying the disk, but at least one file (“CSFACE.RAS”) failed. After a few more minutes, the Atari wouldn’t read the disk at all anymore. Oh well. I’ll have to try again later. This entry was posted in Uncategorized and tagged mom and me, mother's day, yaakov kirschen, Yakov Kirschen on Jun. 14, 2017 . When Star Wars debuted in 1977, the first sequence audiences took in was the iconic opening crawl: a wall of yellow text rolling up the screen, shrinking toward a vanish point in the distance. 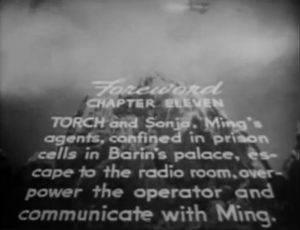 Screen capture of an opening crawl from a Flash Gordon serial. This crawl was George Lucas’ homage to the old Flash Gordon serials of the 1930s (which inspired many other parts of Star Wars visual style). Since then, the crawl has become a common trope cribbed by TV shows, computer games, and others. When I was thinking of ideas I might contribute to Blocktronics’ “Detention Block AA-23” Star Wars artpack, making an ANSI version of the crawl was one of my first thoughts. This entry was posted in Uncategorized and tagged ansi, ansimation, art, blocktronics, demo, Detention Block AA-23, parallax, scrolling, star wars on May. 25, 2017 . I want to push boundaries. That’s what the original Star Wars films did. Industrial Light & Magic revolutionized special effects with novel new techniques for motion control and amazing model work. When I work on ANSI projects now, I try to think about ways to do things in ANSI that weren’t possible in the 1990s because of low bandwidth or limited processing power. Want to know how it came to be? Keep reading. Is today the 40th anniversary of the original release of “Star Wars”? Blocktronics is all over it. The ANSI supergroup’s new artpack “Detention Block AA-23” landed today, and amazingly I contributed a few pieces! The second is an ANSI adaptation of Star Wars’ iconic opening crawl. Finally I snuck in two 80×23 images from “Empire Strikes Back”: Luke and Vader’s saber battle, and Han Solo frozen in carbonite. Anyway, this is the most ANSI I’ve ever contributed to an artpack. I hope you’ll check out the pack, because there is so much other can’t-miss, awesome work from Blocktronics’ rock stars. This entry was posted in Uncategorized and tagged ansi, ansimation, art, blocktronics, Detention Block AA-23, star wars star wars on May. 25, 2017 . Paul Rickards has introduced a cool new gadget called the WiFi232. It’s a Hayes-compatible modem that lets your retro computer telnet to a BBS. Seems like it could be a nice alternative to the UDS series of serial-to-ethernet adapters. Who needs SVG when you’ve got ANSI? Presidential election years are great times to work at a news organization. As a designer at a newspaper, I love to explore the cool election maps developed by folks at places like the New York Times or the Guardian. 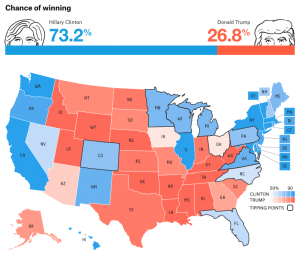 My favorite is probably the 2016 Election Forecast from FiveThirtyEight.com, which is full of cool visualizations, and great analysis. The explosion of great apps like this is made possible by modern libraries like D3.js, and formats like SVG. But what if you took away all the visual horsepower? 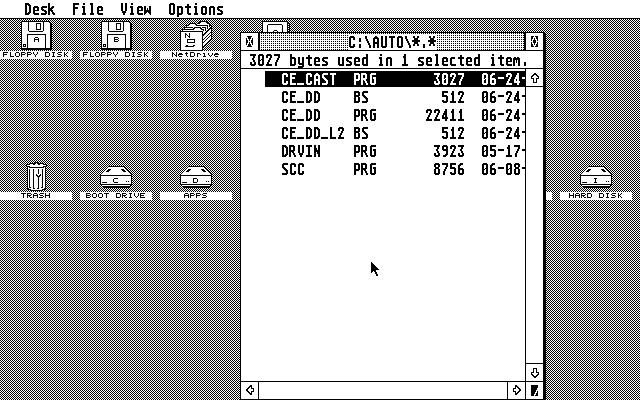 What would a retro BBS version of such an app look like, with all the inherent limitations of an ancient terminal: few colors (16, with caveats), low resolution (80×24), etc ? This entry was posted in Uncategorized and tagged ansi, bbs, design, door, election, fivethirtyeight, news, visualization on Oct. 4, 2016 .